C.G. Jung says that humanizing Jesus is a regress, which ultimately leads to Arianism, rejection of trinity and Ebionitism, the idea that Jesus was a human being and not at all divine. This is a view god which is based more on the Old Testament or on Islam than in Christianity. Arianism does believe that Jesus Christ is less divine and is inferior to God the Father. Obviously if you look in the Jesus Wars, the regress in homoiousie is evident, since the early heryes denied the complex divine and human coexistence of the Caledonian Creed. The gospels are clearly non-historical, painting an image of Jesus, to emphasis his being as human and god, with a particular audience in mind. I dare to say, the Gospels are the earliest and most beautiful faces of Jesus, deliberately created for effect. I think therefore, it is clear that Jesus lived but its historical details are less important than the archetypal symbols he invokes. The gospels already hide his real being behind metaphysical constructs. The whole fertile ground of the Middle East and its religions are already visible creeping up. However, Jesus became an ultimate archetype of the collective unconsciousness in the West and the East as we shall see. C.G. Jung actually saw all attributes of the hero myth in him: strange origin, holy parentage, endangered birth, narrow survival, early maturing, mastering death and separation, miracles, early death, symbolic way of death, postmortem deeds. To Jung the symbolic of the Gospel is a Marriage Made in Heaven : Trinity Finally Becomes a Quaternity. And Jesus is eventually the symbol of the Self and individuation, as I have written here. I think Jesus became such a strong symbol and archetype, that his biography is less important. Unlike most biographies, the Jesus Christ narrative of the gospels does not begin with his birth, or even with his conception. There are even few hard historical records proofing his very existence, as describe below. Clearly a charismatic movement can’t be started without the leader, so existed. The new archetype of Jesus, created by the gospels and St. John are so strong however, that his life before his preaching does not matter only those last two years. The essence of the powerful Jesus archetype is his death and resurrection. This is the most unique selling prepositions in comparison to other world regions. Another is that there were no heirs, was no real family, it was inconclusive if he had wife and kids, and no priest class based on heritage in Christianity after him. Jesus was an outcast, indifferent to family, money, property or rank.Unusual for the Middle East. It is not true that his followers were only the pure, often they had high ranks – but the attraction was logos the word. Let’s say the narrative of the gospel are a somewhat trustworthy biography, therefore I like to recollect it very briefly:. At an early age, Jesus and his family fled to Egypt because an angel warned Joseph in a dream of impending danger. When they returned from Egypt, they settled in Galilee, in the town of Nazareth.Then there is a big gap, only at one point touched by the gospel of Luke. At the age of twelve, Jesus traveled to Jerusalem with Mary and Joseph to celebrate the Feast of the Passover and went missing nut the they found him talking with the priests and teachers. Based on the Writings found in Quaram 1947, one may assume that he belonged and was educated by the desert brotherhood of the Essenes, who lived on the north-west of the Dead Sea. At approximately 30 years of age, Jesus entered into the public space. John the Baptist had preached of the coming Messiah, preparing the way for Jesus’ ministry. John baptized Jesus. After this, Jesus went into the wilderness for a time of fasting and prayer . Then the devil came to him and tempted him unsuccessfully. Jesus began to preach a message of repentance, and from among his followers hand-picked twelve disciples, or the apostles. The teaching and preaching of Jesus convicted, challenged, or encouraged those who heard it. Jesus performed many miracles of healing and restoration, as well as miracles designed to teach a lesson. Then he provided the way of salvation from sin by way of the ultimate sacrifice, his crucifixion , followed by his resurrection from the dead after three days. The philosopher Karl Jaspers counts Jesus one of the most important men in humanity, together with Buddha, Socrates and Konfuzios. See below, how little we know from the historical Jesus. No, I didnt’ make up the word. There has to be a balancing between the masculine and feminine energy in Christianity. That is why feminism is a dead end: because they cannot give up what some have called “feminist dualism”. Having said that clearly the Vatican and Christianity owes women their impact as a world religion. “I and my Father are One” – says Jesus…..what does this mean? It explains more than the Trinity and Caledonian Creed: God the Father, God the Son, and God the Holy Spirit. They are all One yet they are separate as well. It als means, God is the Father, Jesus is His Son, and both feel good about this. Today most sons (and often fathers) say, “I and my Father are Not One – we are at variance or at odds “. This is a problem of the industrial revolution, but even before, the Catholic Church did well with Mary. I mean here Holy Mary but also Mary Magdalene. Lets face i,t the love of mother is perceived as unconditional, whereas father’s love was always connected with an important fact of socialization – conditional love. Today the father imago is created almost exclusively by mothers or hostile media. 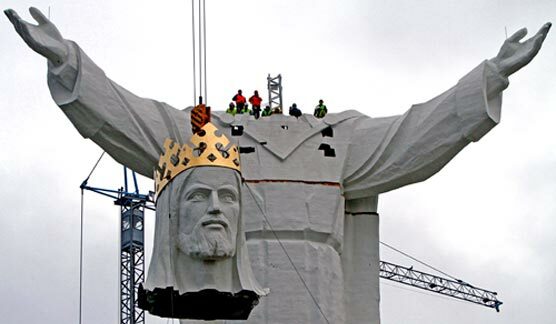 But the Catholic church, depicting Jesus as innocent blue eyed nice guy did not help either. The Church discarded the Shaman energy discard mal energy, still found in the fraternity of monks with the power to proselytise. Jesus thought highly of John the Baptist, the Wild Man. Only after he had been imprisoned he went North to found his movement. I mean really, much of Church teaching is alien to a dualistic (gnostic) understanding like God/Satan, good/evil, sacred/profane, pater/nun. In Jesus one would think, there would also be ‘masculinism’ to counter balance ‘radical feminism’ but certaily also a male only hierarchy, todays pharisees. A lot of they published opinion on that, however, is not Christian, it’s not very Catholic either, but just profane voices out of the spiritual void to undermine Jesus’ one Holy, Catholic, Apostolic and not only the indeed very female Church. I have my doubts, we will ever get a sermon from Pope Francis denouncing radical feminism. I suspect the fact that will ever happen is the biggest proof radical masculinism is alive and well in the Roman Catholic Church. Contemporary feminism believe that the “true” history of Jesus – without idolatry – will decide, if an own feminist religion must be constructed or a feminist Christianity may evolve. Obviously the have a problem with Jesus as a man and perceive especially priesthood as patriarchical relict. Pagan myths of the goodness who rests the dead hero in her lap are projected to historical women from Mary Magdalene. Taking the gospel as history, indeed Many of Jesus’s followers were female. They were not included in the 12 apostles, but the community surrounding him was far larger than that. Women were also among his key supporters. I find myself in an interesting tension. I think overtly feminist views, especially those of the atheist-feminist circles miss the point but I do see may see as a shift from early Christianity towards a patriarchal religion. 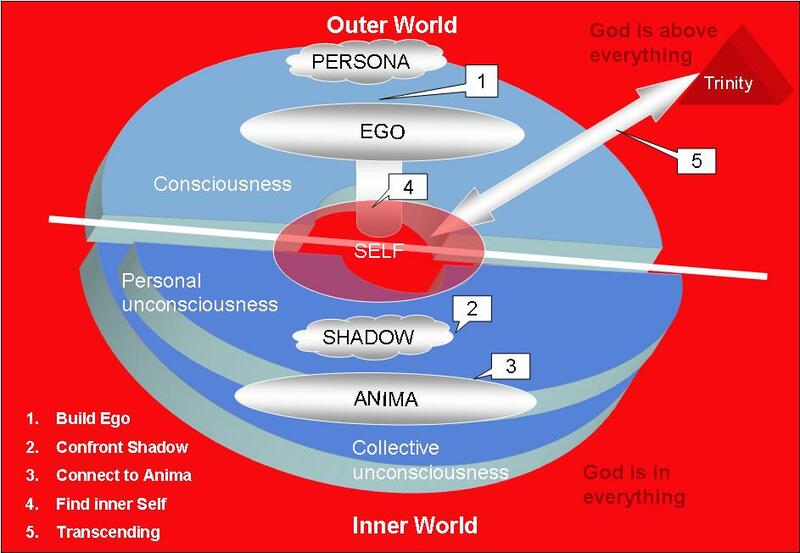 After individuation, or the suffering and the death of the Ego (the I) on the cross, we reach our self. A Buddhist might say, welcome, we already here, we don’t even know the concept of Ego. It seems therefore the Cruzification must be disturbing for Buddhists. Incarnation: Jesus is as one with God and humankind’, stressing ‘divine humanity and absorption into God. The Unbound Christ: Jesus is not bound by Christian dogma, or Western Church’s tradition, not bound by formulations which restrict, nor bound to that institutions. St. John Damascene’s critique of Islam was contesting Muhammad’s Arianist contention that only the appearance of Jesus was crucified, not the actual body of Jesus. “In Dante’s Inferno, Canto XXVIII puts Muhammad and Ali in the Circle of the Schismatics, not that of Heretics. 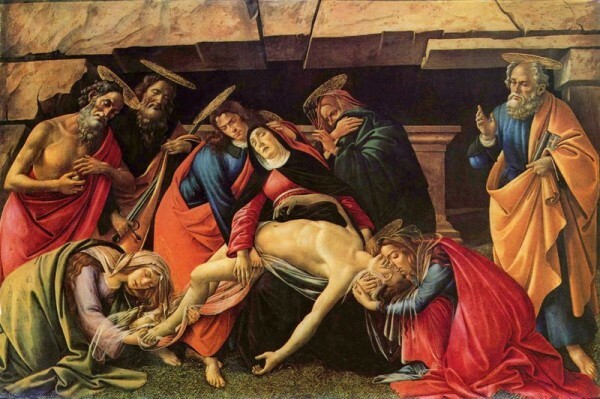 The angel slashes at the damned schismatics to symbolize their tearing of the Body of Christ. Meanwhile, quite a few levels higher up, the heretics are interred alive in flaming coffins. Islam is seen from Christians as a heresy, and a recrudescence of Arianism as well as a weird forerunner of Jesus in feminism (which also denies the incarnation), but is reckoned a schism in the Inferno. This issue somewhat different with Shiites and quite different with Sufism, who refer to Jesus as wise ascetic man with secret knowledge. There is a Peter Joseph’s Internet film series, Zeitgeist, which asserts that Jesus never existed and is in fact a mythical character, in a Jungian sense a symbol (derived of collective archetypes), based on the Egypt sun god Aton. Some of what the Internet film asserts , essentially a New Age product, is true. Unfortunately, this is mixed with material that is only partially true and much that is plainly and simply bogus. He sees all the motifs and characters of the New Testament as coded astrological or solar references. The argument that Jesus was a mythical construct has been made and nowadays often commercially motivated — there are a number of people claiming that the accounts of Jesus as recorded in the New Testament are simply myths borrowed from pagan folklore, such as the stories of Osiris and Mithras. The claim is that these myths are essentially the same story as the New Testament’s narrative of Jesus Christ of Nazareth. As Dan Brown claims in The Da Vinci Code, “Nothing in Christianity is original.” To discover the truth about the claim that the Gospel writers borrowed from mythology, it is important to (1) unearth the history behind the assertions, (2) examine the actual portrayals of other gods being compared to Christ, and (3) expose any logical fallacies being made. The claim that Jesus was a myth or an exaggeration originated in the writings of liberal German theologians in the nineteenth century. They essentially said that Jesus was nothing more than a copy of popular dying-and-rising gods in various places— Mesopotamia, Syria, Asia Minor, and he trinity of Isis, Osiris and Horus in Egypt and asserted that there is no evidence for a historical Jesus. I am Christian, but I think this misses the point. The thesis ignores the messianic/apocalyptic aspects of the New Testament writings, that indeed a charismatic person is needed to kindle a spiritual movement. Religions are ritualized spiritual systems, but also cultural constructs which influence each other. Successful religions utilize archetypes and symbols, often consciously or unconsciously borrowing of each other like great artists. In the book – The lost history of Christianity – Philip Jenkings provided many insights of the Eastern Christians, particularly since he makes clear, that also religion history is written by the victor or winner. Religions deteriorate, vanish or die. Religions get killed and when that happens they leave ghosts or vanish without traces.That is very evident in the short-lived cultural revolution, which led to the worship of Sun God Aton and it failing after twenty years. This first attempt to a monotheistic religion also did not come out of thin air, but as I have written most likely from Syria in “Jungian archetypes of Nefertiti and the Heretic Pharaoh Akhenaten”. I suggest strongly, the gospel writers knew and learned from this failure. The gospels always had a target audience in mind. 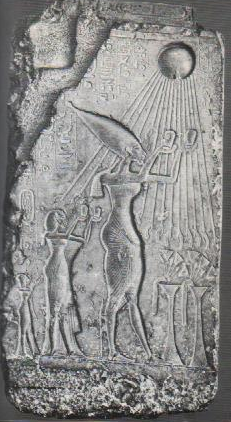 Akhenaten, the pharaoh who carried out a religious revolution which, for a period of about twenty years, replaced the age-old beliefs and practices of the Egyptian religion of about 2000 god and goddesses in human, composite or animal form for one single abstract concept – the sun (Aton). He did away with an elaborate and powerful system of priests, temples, and iconic images in particular with Amun the god of all gods. Its priests were at that time almost as powerful (and rich) as the Pharaoh. Akhenaten alone was the mediator to god and asked to be worshiped, actually with his wife as holy family. He was the son of Aton. Akhenaten, the new capital with temples was built from scratch, like Brasilia, but Akhenaten lasted only 20 years and almost destroyed the Egypt empire. “O Sole God beside whom there is none”. Akhenaten has often been brought in connection with Jesus and more often Moses. The worship of idols (symbols of transcendence) eases and ends with with pure monotheism. Strict monotheism prohibits images , rejects any magical acting ceremony and puts the emphasis on the writing and worldly ethical requirement as gods law without constraints of idolatry. The murder of God , also known as parricide , is the main subject in Freud’s Moses and Monotheism religion – the historical truth of religion. Moses is, according to Freud , ” the creator of the Jewish people ” (IX , p 553 ), and he explains this as follows: Moses himself was an Egyptian living in Egypt who imposed to a Jewish ethnic group the already banned again monotheism of Akhenaten as their own religion. Then, he led this people (shortly after Akhenaten’s death ) out of Egypt. 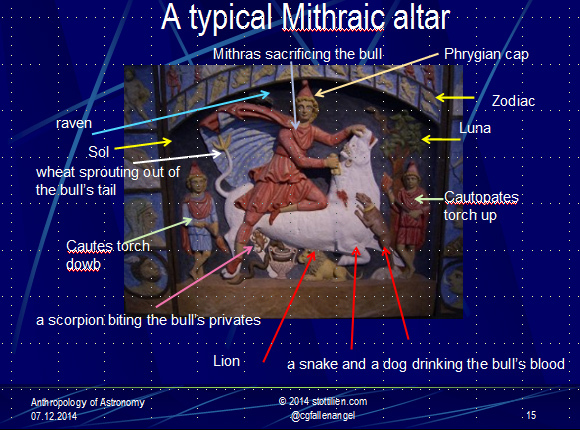 I recently attended a lecture of an Mithras expert. He explained, that mainstream scholarship speaks of at least three Mithras: Mitra, the Vedic god; Mithra, the Persian deity; and Mithras, the Greco-Roman mysteries cult. There was, however, always a problem with Cumont’s assumption that the Mithraic mysteries derived from ancient Iranian religion, the iconography in ancient Iran was different from the primary fact of the Roman Mithraic cult.lSince the 1970s, scholars have generally argued against Cumont’s master narrative of east-west transfer. whereas recently now render a revised Cumontian scenario of east-west transfer including Armenian religion. The important icon in the Roman cult was the tauroctony. This scene shows Mithras in the act of killing a bull, accompanied by a dog, a snake, a raven, and a scorpion; the scene is depicted as taking place inside a cave like the mithraeum itself. 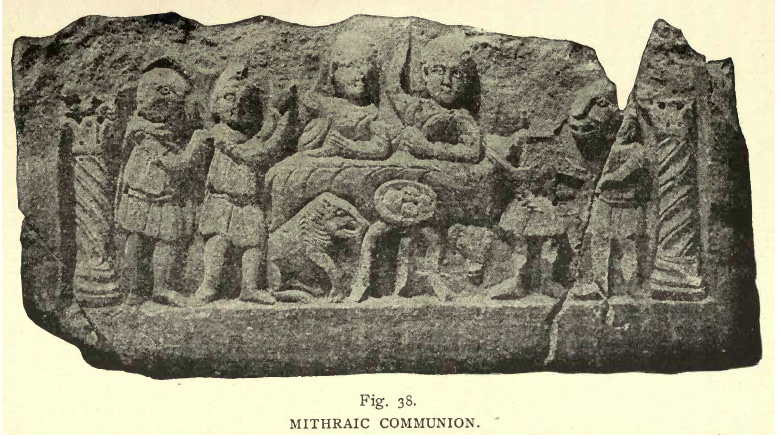 If the god Mithras of the Roman cult was actually the Iranian god Mithra, we should expect to find in Iranian mythology a story in which Mithra kills a bull. However, the fact is that no such Iranian myth exists: in no known Iranian text does Mithra have anything to do with killing a bull. Franz Cumont, the major expert in the twentieth century had responded by pointing to on an ancient Iranian text in which a bull is indeed killed. However, in 1971 in the course of a Congress Cumont’s scholars at the Congress hypothesized that the Roman cult of Mithras was actually a new religion, and had simply borrowed the name of an Iranian god in order to give itself an exotic oriental flavor. A dam was broken in regards the study of the Mithraic mysteries, its pictorial may not be based on the Iranian myth, but rather something utterly different: namely, an astronomical star map and the cult an new astral religion, for soldiers of the declining Rome as Rober Tucan pointed out. As one of the competing cults in the second century, Mithraism has been compared to Christianity, pointing to numerous similarities. It should be kept in mind that if elements from Roman, Armenian and Persian Mithraism were utilized, not as a whole ideology but as separate items, that is a very usual behavior of religions, which utilize and occupy archetypes in Jungian sense to prevail. Thus, the following list represents possible independence of Christianity and Mitra/Mithra/Mithras cult. Mithras was born on December 25th of the virgin Anahita. Mithras represents the “Way, the Truth and the Light,” the Redeemer, the Savior, the Messiah. His sacred day was Sunday. The Roman Mithra cult had a rite similar to the eucharist meal. Mithraism had a sort of baptism although with ritual blood. The Roman Mithras cult has many other attributes not common with Christianity, particularly its central mythical secret, Mithra slaying the bull. The cult of Isis was the opposite of the “men religion” of Mithras. As we see later, Jesus bears similarity with Horus, whereas Isis clearly had influence on the archetype of the Holy Mary in Christianity. The cult of Isis entered around the Egyptian deities Isis and Osiris is very likely brought to Rome under Marcus Antonius. It had a popular following up until the fourth century AD, but as Christianity took a firmer hold was completely eliminated by the sixth century. The central image of the cult concerned the myth of the death and rebirth of Osiris. While the rituals of the cult remain a mystery even today, we do know that in the initiation ritual the initiate experienced symbolic “death” and “rebirth,” purified by the Goddess Isis. The cult mainly concerned itself with concepts of material sacrifice (such as fasting and donations of wealth), and rituals involving symbolic death and the revelations of cult secrets. Unlike other mystery religions, there were both yearly rituals and daily services. Rodney Stark suggests that the cult of Isis was the largest competitor for Christianity in the Empire, especially concerning the inclusion of women as priests and worshipers equally. I will go in the next chapter in the details of iconography of the Virgin Mary which often bears similarity to Isis, and Isis’ titles such as the “Queen of Heaven” a reference to the Virgin still used. Finally, Osiris’s promise of eternal life (through his sacrifice) for his followers has clear parallels to early Christian understandings of Christ. Certainly Christianity combined a bit of religious syncretism with quite unique selling propositions (see “Isis, Mithras and Jesus: Clash of male and female Archetypes in classical Rome“. All religions did that and some are only cut and past or heretical offshoots. Certainly the Egyptian culture has influenced much of the world over a period of centuries and millennia. The Egyptian religion was, like that of many cultures, polytheistic and pantheistic at the same time and for a brief period even henotheistic, often referred as first attempt to a monotheistic belief system. Religions are based on myths and beliefs, hence must be based on archetypes. A scholarly fashion claims that only by coincidence Christ and not the Egyptian Isis or the Persian Mithras gained the upper hand as a world religion. There is some truth in it, but also an utter disregard of the attractiveness of Christianity at that time and uniqueness of its offering. A globalized Roman Imperia created a market of religions. Furthermore the exclusive – or shall I say smart – Christian religious offerings took in account the Romans’religious preferences and the weaknesses of the many competing religions and cults. Its explosive growth was supported by a successful sociological approach and a savvy management style – strategic global, acting locally but centralizing its control over teachings. But most of all on powerful symbols and archetypes. So let us in this article analyze Jesus’ many faces, using Jungian methodology of symbols and archetypes. The first assertion which can be made is, that the cross – was a known symbol of Quaternity, explained here, and not only a representation of the instrument of Jesus’ execution. The Christian cross probably represents a melding of the real crucifix shape with the solar cross as a bit of religious syncretism. The cross has been always a symbol of the four cardinal directions and the four winds. Hence, the solar associations of the cross, calls on another archetype as symbol of the Crucifixion. That’s true enough but falsifies nothing. When it comes to Egyptian sources of the Christ myth, the Isis/Osiris/Horus myth, by Plutarch, goes as follows: Set, the evil brother of the good Osiris, murders that god and cuts his body into 14 pieces. Isis, the wife of Osiris collects and reassembles the pieces, minus one, the phallus (such thirteen the unlucky number). She copulates – without phallus – with the dead god in the form of a bird, conceives Horus and gives birth to him and let him raise in secret. Osiris becomes resurrected from the dead, although only as God of the underworld. When Horus comes of age he does battle with his uncle Set. The physical resurrection of Osiris, even though it is in the underworld, is a significant precursor to Jesus as a dying and rising god, found in many other Indian, Asian and classical myths. Surprisingly, Joseph fails to mention this bit of classical mythology. Horus being born and nursed in the rushes of an island in the Nile is an important parallel to the infant Moses being found among the rushes. The underworld and hell is an old construct. However, besides the resurrection of Osiris, there are other parallels between the Egyptian myth and the New Testament like the – sort of – virgin birth. Isis with the dead body of Osiris prefigures the imagery of the Pieta. More importantly, Christians definitely took over the imagery of Isis and the infant Horus in the form of the Madonna and child. Certainly, the virgin birth and the elevation of the Virgin Mary in the Gospel of Luke reflects pagan influences on the Christ myth, which can be seen in the Lucan Nativity and which sharply contrast to the messianic/Davidic kingship motifs of Matthew. As previously noted. Luke’s Nativity seems to be based on Egyptian panels from Luxor dating to the 18th dynasty and the reign of Queen Hatshepsut. The panels from Luxor depict the mother of Hatshepsut being told she will bear the divine child. 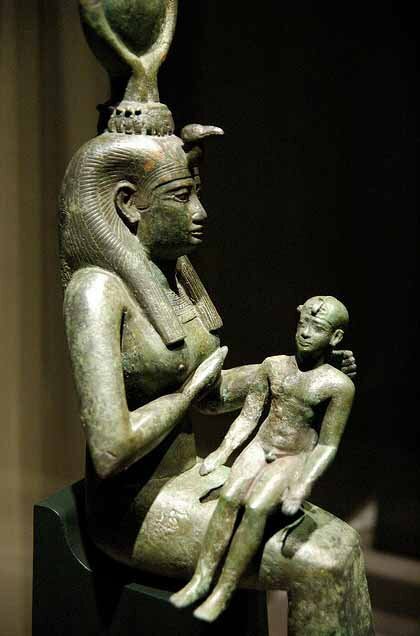 Next, the god Amon-Ra consorts with Hatshepsut’s mother. Then the divine child (Hatshepsut) is adored by gods and mortals. This is probably the source of Luke’s Nativity. Mary is told by the angel Gabriel she will bear the divine child. The Holy Spirit overshadows her. Then angels and mortals (shepherds) adore Jesus. Copulating with Amon Ra was part of the standard Egyptian royal myth of each Pharaoh. Amon Ra, taking his father’s mortal form to have sexual relations with the Pharaoh’s mother here even more important because Hatshepsut, a rare female Pharaoh had to prove rank and heavily decent, because as a female, she was assumed to have ordinary mortal origins. The December 25 — is significant, but Mithra in his solar aspect as Sol Invictus (Latin for “Unconquered Sun”). The reason Mithra/Sol Invictus was born on December 25 was that in the Roman calendar of that day, that was the Winter Solstice, the 24-hour period having the fewest number of daylight hours. True, Christianity had a nasty habit to hijack pagan holiday, so the birthday of Mithra as a way of occupying a rival’s holiday. Furthermore there is one astronomical event the Christ myth. This is obvious with the magi following the star in the Nativity story of Matthew. In the original Greek of the New Testament, what is translated as “wise men” is magi, that is, Zoroastrian holy men. The Greek word magos is the source of our words mage, magic and magician. Second, Matthew nowhere says how many magi came to Jerusalem. So where did we ever get the idea there were three of them? Also, if they were actually following a star, it would have led them directly to Bethlehem. The star doesn’t actually lead the magi until they have been told by Herod’s scribes to go to Bethlehem. Only then does the following happen (Mt. 2:9–11). It is in these three gifts, along with the eastern origin of the magi, that we see the key to the actual myth in Matthew’s Nativity, which is political. Throughout Mathews Nativity account, the gospel’s author takes great pains to find fulfilled prophecies showing Jesus to be the messiah of the Davidic line of kings. He is born in Bethlehem because that was David’s home town, and Jesus must be born there to fulfill the prophecy in Micah 5:2, which the chief priests and scribes quote to Herod when the magi ask where the baby is that is born to be king of the Jews (Mt. 2:5, 6). So Bethlehem’s mythic associations have to do with Davidic kingship, not astrology. The three gifts also reflect Davidic kingship, since the Queen of Sheba gave King Solomon rich and kingly gifts (1 Kings 10:10). These included a great quantity of gold and, by implication, since Sheba, or Saba was located in modern Yemen, at the southern end of the Red Sea, frankincense and myrrh. Sheba, or Saba, in Yemen is at the southern end, the point of origin of an ancient caravan route that stretched from Yemen to Damascus called the “Incense Route,” since what was traded from the southern end of the Red Sea were two forms of incense, frankincense and myrrh. Thus, the infant Jesus received from the magi the same gifts given to Solomon by the Queen of Sheba. Easter in the Passover season was probably originally a festival of first fruits, that is, a seasonal, agricultural festival relating to rebirth. 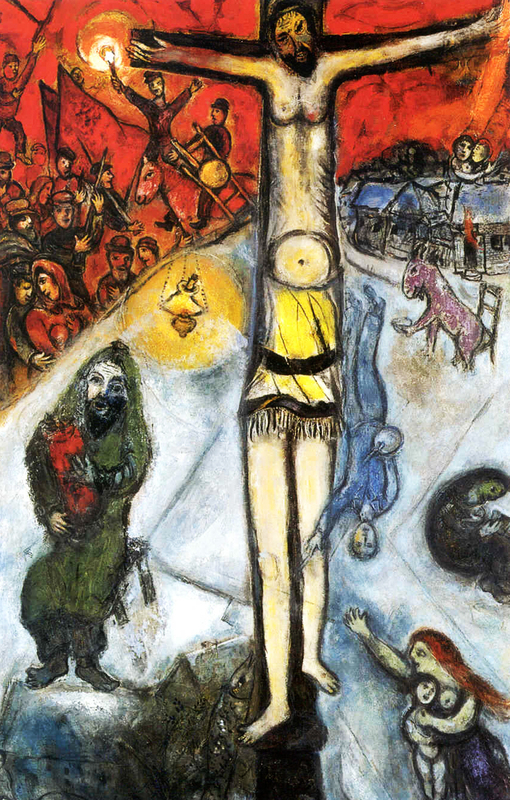 However, Jewish seasonal festivals relating to a cyclic view of time were recast in messianic, apocalyptic terms as historical and related to a linear concept of time. In the case of Jewish belief, I believe it’s safe to say that the linear, historical view effectively eclipsed the original seasonal festival. Since the Christian Passion and Resurrection narratives reintroduce a dying and rising god meme into the holiday, the layering of Easter becomes far more complex. Easter blends apocalyptic messianism, emphasizing Christ’s death and resurrection as the critical turning point in God’s war with Satan, and portraying Jesus as the culmination of Israel’s hopes and dreams, with the dying and rising god motif, and the promise to Christians that they, too, would transcend death. It must also be remembered that the cult of Isis and Osiris, which spread through the Roman Empire about a century before the time of Jesus, was not entirely the same as the millennia old Egyptian fertility cult it had originally been. Rather, it was, in all probability, Hellenized and showed some of the refinements of Greek philosophy. As to the sighting of Easter near the time of the Vernal Equinox, we must remember that the Passion is staged during Passover. There is a complex layering here that is lost if we simply relegate Easter to a celebration of the Vernal Equinox. Jesus having 12 disciples relates more to Jewish Messianism. The 12 disciples relate to the 12 tribes of Israel, which, though they no longer existed as political entities, were important to the extent that Paul could confidently claim to be of the tribe of Benjamin (Romans 11:1). Actually, there were 13 tribes, 12 plus the priestly tribe of Levites. Each tribe originally supported the Levitical priesthood and maintained the central shrine for one month a year. The division of the tribes worshipping Yahweh into 12 divisions may well reflect influences of the lunar calendar. Jesus’ crown of thorns, along with most of the specific details of the Passion — his being clothed in a purple robe and given a reed as a scepter, the mocking and scourging by the Roman troops, even his being put to death — were probably elements of the Zagmuku Festival, coming from Babylon after their captivity there (587–538 BC). Elements of this festival are to be found in the entirely fictional Book of Esther and the celebration of the Jewish holiday of Purim. The dawn of Christianity coincided with the Symbol of the fish and its trouble with dawn of Aquarius. When Jung was dying in 1961, age-old and terminally ill from heart problems, his thoughts circled round the Far Eastern practice of the rebirth. Now, so he entrusted friends, he will probably learn shortly what the Self is all about. In 1958 Jung, in a writing with the title “a modern myth”, he had forecast the coming world order in the sign of the Aquarius: “Now we approach”, he announced, “the big change, with the entry of the spring equinox we expect the coming world order in Aquarius” with “secular changes of the collective psyche”. Jung’ assistant , Aniela Jaffé tied it with transition with the (decline) of the Christianity whose symbol is the fish. She claims, that possibly thousand years ago – as the second part of the Pisces sign was touched, the age of the Antichrist begun whose climax we experience right now. 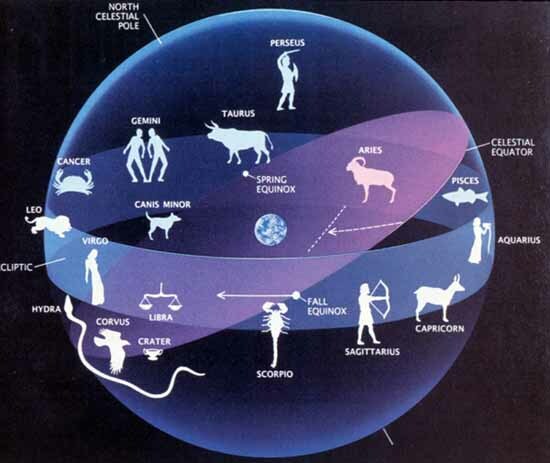 The zodiac is a spherical celestial coordinate system. It designates the ecliptic as its fundamental plane and the position of the Sun at Vernal equinox as its prime meridian in 12 equal parts. In astronomy, the zodiacal constellations are a convenient way of marking the ecliptic (the Sun’s path across the sky) and the path of the moon and planets along the ecliptic. The gradual shift in the orientation of Earth’s axis of rotation changes the apparent position of the vernal equinox through all twelve traditional constellations of the zodiac, at the rate of about 2150 years for one of them (called a Great Month) in a full cycle of ca. 26,000 years (called a Great or Platonic Year). We have entered or will enter the Aquarian Age and looks like the beauty of it lies in the beholder. The edge established between Pisces and Aquarius locates the beginning of the Aquarian Age around the year 2150. C.G. Jung followed interpretation that the Age of Aquarius will begin in AD 1997 but in the Mayan Calendar / Egyptian Cycle of the Phoenix begins AD 21 December 2012. We live indeed in emotional and intellectual disturbed times. . The reason of the Great Year is an axial precession of the earth similar to the precession of a spinning top due to gravity. The precession of the Earth’s axis has a number of observable effects. First, the positions of the celestial poles appear to move in circles against the space-fixed backdrop of stars, completing one circuit in 25,772 Julian years (2000 rate). Thus, while today the star Polaris lies approximately at the north celestial pole, this will change over time, and other stars will become the “alignment star” for star gazers. Secondly, the position of the Earth in its orbit changes relative to the backdrop of the stars and therefore also the vernal equinox slowly regresses a full 360 degree through all twelve traditional constellations of the zodiac, at the rate of about 50.3 seconds of arc per year. Modern astronomy aside, all religions and cultures have recognized the vernal equinox for thousands of years. The date is significant in Christianity because Easter always falls on the first Sunday after the first full moon after the vernal equinox. It is also probably no coincidence that early Egyptians built the Great Sphinx so that it points directly toward the rising Sun on the day of the vernal equinox. The first day of spring also marks the beginning of the Persian New Year in the 3,000-year-old tradition of Zorastrianism. Other important advanced civilisations of the humanity – Maya, Sumerian, Chaldaean, Egypt’s, Chinese etc. – held a similar idea of the change of Aeon’s and interpreted it in religious and mythical traditions . ‘Aeon’ comes from the Greek and means “long time” originally a name of the old Persian eternity God czar’s van akaran (=time without end). In the numerous mystic schools of the later Gnosis, which heavily influence C.G. Jung, “Aeon”, loses this original meaning and defines those long zodiac periods 0f 2150 years. Aquarian age will foster in a period of mass consciousness. Furthermore we saw the appearance of dictators, extreme self-expression. Traits of Aquarius such as being ‘humanitarian’ but at the same time ‘unemotional’ may indicate to the emergence of active trans-governmental organisations and global “solidarity” movements. Alternatively, it may indicate individual New Age spiritual awakening. Christianity (Monotheism, Spirituality) The Age of Pisces is characterized by the rise of Christianity (founded 1st Century) and Buddhism (founded 6th to 4th Century BC) due to the “spiritual” nature of Pisces to go beyond the boundaries of the physical world. Old Testament (War and Fire) When Moses descended from the mountain with the ten commandments (c. 17th – 13th century BC, the end of the Age of Taurus), he instructed the worshippers of the golden calve to be killed. Represents Moses “killing” the bull and ending the Age of Taurus, starting his Age of Aries. Earth, Agriculture: This age is notable for theEgyptian and Iranian Empire. Mithra was the Iranian god of the sun, justice, contract, and war in pre-Zoroastrian Iran. Mithras in the Roman Empire during the 2nd and 3rd centuries ad, was honoured as the patron of loyalty to the emperor wit the “slying bull Icon. They personify structure, solidity, stability and attempts at eternity, ‘strength’ but at the same time ‘sensuality’ may be attributed to civilizations such as Ancient Egypt’s and Persians. Trading: During this age writing developed, and trade started to accelerate. Both writing and trade (including messaging) are traditional archetypes belonging to the ruling planet Mercury or Gemini. The wheel, is an archetypes associated with it. The Golden Age: De-glaciation of what now constitutes much of the habitable world. Leo is a Fire sign and is traditionally ruled by the Sun. 12650 – 10500 BC End of last Ice Age. Clay Pottery. First intensive hunter-gatherer culture. First agriculture in near East. 13800- 12650 BC Lascaux cave paintings. Arrival of humans in America across Bering land bridge. According to this scheme the Age of Taurus (the Bull) was ending or had ended when Moses led the Israelites out of Egypt and was being superseded by the Age of Aries (the Ram). This age was, in turn, superseded by the Age of Pisces, in which we live, but which is now winding down. It will soon be followed by the Age of Aquarius, hence the song by the same name from the musical Hair. The blowing of the shofar, specifically a ram’s horn, and other symbols indicate that Judaism came, initially, out of the Age of Aries. Since Christianity came into being at the beginning of the Age of Pisces, fish symbolism is particularly common in the New Testament. Thus Jesus tells the fishermen he recruits (Mark 1:17), “Follow me, and I will make you fishers of men.” Thus he feeds the multitude with loaves and fishes, and thus the fish is a Christian symbol. So, was the fish imagery in the New Testament a reference to the Age of Pisces? When Jesus spoke of the “end of the age,” was he referring to the transition from the Piscean to Aquarian age some 2,000 plus years into the future? More maybe than yes. First we must assume that the story of the golden calf in Exodus refers, as it would seem, to general idolatry. Fish certainly are major images in the New Testament. Yet so are olive trees, fig trees, sheaves of grain, and, particularly, sheep and lambs. The astromical explanation of the tauroctony is based on two facts. First, every figure found in the standard tauroctony has a parallel among a group of constellations located along a continuous band in the sky: the bull is paralleled by Taurus, the dog by Canis Minor, the snake by Hydra, the raven by Corvus, and the scorpion by Scorpio. Second, Mithraic iconography in general is pervaded by explicit astronomical imagery: the zodiac, planets, sun, moon, and stars are often portrayed in Mithraic art (note for example the stars around the head of Mithras in the carving of the tauroctony illustrated above); in addition, numerous ancient authors speak about astronomical subjects in connection with Mithraism. In the writings of the Neoplatonic philosopher Porphyry, for example, we find recorded a tradition that the cave which is depicted in the tauroctony and which the underground Mithraic temples were designed to imitate was intended to be “an image of the cosmos.” Given the general presence of astronomical motifs in Mithraic art and ideology, the parallel noted above between the tauroctony-figures and constellations is unlikely to be coincidence but of course a coincidence is never a proof in history. As I said before, the historical Jesus became meaningless but certainly is attractive. 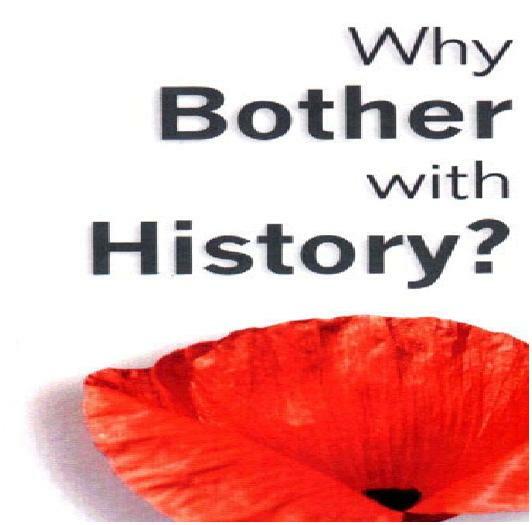 The cynical view history – the story of the past, told at present for present purpose has never been so true, The mentioned movie Zeitgeist asserts that Christianity was, in fact, developed by the Romans as a means of social control. He cites the Council of Nicaea in 325 as the beginning of it. I would say the Romans tolerated Christianity as they considered it politically harmless, that is true and it had followers in high ranks. However who wants to understand, why academic Europeans turned to Indian gurus in the sixties and a sacral religion of supra-nationalism today, should rather read Jung than Freud; Jung is a precursor of that capitalism and civilisation criticism which becomes more than valid in view of the menacing economic and spiritual disasters of literally dying societies. Secularism in the West and not bring enlightenment but a soft totalitarian Socialism in partnership with the New World Order of the “Masters of the Universe”. Presumably before the start of the current global mess and violence, the age of the Aquarius promises an era of nonconformity and individualism defined by qualities like tolerance, openness and a non-egalitarian but elitarian world bourgeoisie. I don’t think elitarian is a word, but more feudalism and hidden goals. Hence, the Aquarius Age by worldwide interlinking and globalisation it creates the base to centralize the problems of the humanity worldwide essentially in a post democratic way but there is also a decentralized counter movement. The New World Order or the emergence of a totalitarian trans-national government seem more likely than the anticipated new human millennium the musical anticipated. Both the church and academia have gotten along successfully without the historical Jesus for centuries. The historical Jesus, the human being who walked the roads of ancient Israel, gathered disciples, and was executed by the Romans, is often contrasted with the “Christ of faith,” a supra-historical figure whose presence in the world has enlivened and nourished Christian communities. The latter has always been far more important for most Christians. Was there a real jesus? Many have assaulted on the historicity of Jesus, claiming that, outside the New Testament, there is no indication that Jesus ever existed. Why is there so much attention now to the person of Jesus? Is it part of our interest in people’s private stories, an impulse that multiplies talk shows and sells People magazine? Is it our need to humanize our heroes to make them more accessible? Is it part of the search for roots, and our desire to reclaim our pasts in a way that contributes meaning to our present? Is it simply part of humankind’s enduring interest in religion, which takes many forms, but never really fades? The answer is probably a bit of each. Truth is the story of the past told at present for present purpose. In fact, the current wave of books constitutes a third quest for the historical Jesus. The first largely Protestant quest — from the late eighteenth to the late nineteenth century — breathed the air of the Enlightenment, presenting Jesus in utterly rational terms, explaining his miracles as natural phenomena, and depicting him as a teacher of timeless wisdom. It came to a close with Albert Schweitzer’s book, The Quest for the Historical Jesus, published in 1906. He concluded that the historical Jesus must be a “stranger and an enigma.” The Jesus designed by nineteenth-century rationalists never had any existence. Furthermore, what little we could know about this Jesus was irrelevant to theology. Jesus means something to our world because a mighty spiritual force streams forth from Him and flows through our time also,” wrote Schweitzer, “This fact can neither be shaken nor confirmed by any historical discovery.” The current generation of Jesus researchers have similarly bracketed questions of theology. The second quest was centered in Germany in the 1950s and 60s, led by Ernst Kasemann and others who were influenced by and in reaction to the towering New Testament scholar Rudolf Bultmann, who argued that most the Gospel accounts of Jesus’ life grew out of the mythos of the early church. These scholars argued that Christian theology could not be cut off from history and developed a set of criteria for deciding what is historical in the gospels. Although their existentialist theology now seems dated, many of their rules for assessing historicity continue to be utilized, for example by the current “Jesus Seminar,” a group of scholars re-examining the synoptic traditions and particularly the sayings of Jesus. They have produced The Five Gospels, a work that evaluates the four canonical gospels and the non-canonical Gospel of Thomas for authentic sayings of Jesus. Despite how often the question of recovering the Jesus of history has been declared hopeless, it has nevertheless generated a vast literature. What distinguishes the latest crop of Jesus scholars from their predecessors is that they understand Jesus within the context of Jews and Judaism in the first century. This generation also has access to more materials. The Dead Sea Scrolls, only recently available to a wide range of scholars, do not mention Jesus, but they do illuminate a brand of apocalyptic thought and expectation alive in the first century. The urgency of the impending apocalypse that John the Baptist and Jesus preached has been muted by 2,000 years of church history, but the Dead Sea Scrolls remind us that many expected the end of the world would be violent and imminent. In addition to the information from the Qumran materials, recent archaeological finds correspond to details of the Gospel stories of Jesus. The skeleton of a crucified man was discovered in Israel on Giv’at ha Mivtar. His ankle bones were pierced and his legs broken, giving evidence of the nature of Roman crucifixion. In 1990, archaeologists discovered an ossuary containing the bones of Joseph Caiaphas, the high priest who interrogated Jesus in the Gospel of Matthew and is mentioned in the Gospels of Luke and John. Jesus preached the kingdom of God, not himself. This kingdom is about God, not Jesus himself, and is on earth. It addresses two main concerns of peasants: bread and death. I am not surprised, that the he historical Jesus and the Jesus of the early church bear little resemblance to one another. Even more tenuous is the connection between the historical Jesus and later Christianity. Contemporary Jesus scholars seem to agree one can be a good Christian without knowing a bit about this Jesus of history. The flesh-and-blood Jesus in the late ’20s of the first century gave way to the reconstructed and interpreted Jesus of the gospels in the 70s and ’80s and was superseded by the “Christ of faith” of the later church. When believers speak of their faith in Jesus, it is this last figure to which they refer. Jesus’ view of himself also differed widely from the early church’s. Whether he saw himself as the Messiah is debatable, but he almost certainly did not see himself as divine. His followers, and even a non-believer like the Jewish historian Josephus, recall Jesus as a healer, exorcist, and miracle worker. Interestingly, his detractors neither call him a fraud, nor say the miracles were faked, but attribute his powers to Satan or demons. 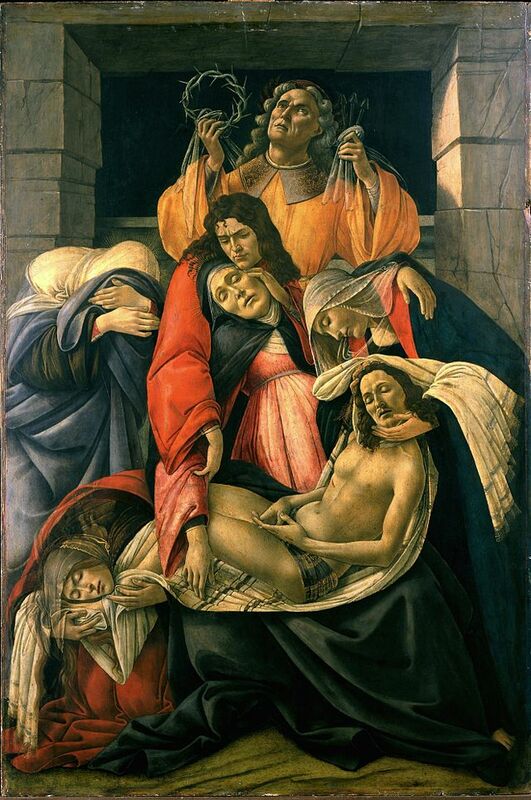 Except for a few of the women, the bulk of Jesus’ followers abandoned him at the time of his death. Nor did his family seem to support him during his ministry. At one point (Mark 3:20-2 1), they think he is possessed. 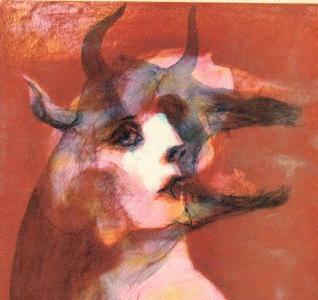 I love the stories of Mary Magdalene, no only from a Jungian point of view. That Jesus was a devoted family man with two kids and Mary Magdalene for his wife, new history book always based on an ancient manuscripts claim every other year also 2014. Claims that Jesus was married have been published before. One of the latest cases was the 2012 discovery of an Egyptian papyrus fragment, which some scholars believed to be the first explicit reference to Jesus being married. There most plausible and enigmatic story is connected with the Cathars. In “A Jungian journey through a land of heretics and Mary Magdalene” I have written a bit of it. The anti-CatharErmegaud deBeziers and Durand de la Huesca wrote that the Cathars secretly taught that Mary Magdalene was the wife or concubine of Christ;and also that she was the woman ‘taken in adultery’ who Christ had saved from the Jews who wanted to stone her. According to his story, after Jesus’ death (or ascend into heaven) she flew and moved to France. Petit Provence is the region in southern France adjacent to Aude andHerault where Mary Magdalene and the others came ashore at St.Maries de la Mer. A painting of Mary Magdalene is at the Church in LesSaintesMaries de la Mer, which is west of Marseille showing the boat carrying Lazarus, Martha, Mary Magdalene and a young girl named Sarah. Also the sister of the Virgin Mary and several others are shown on the boat. 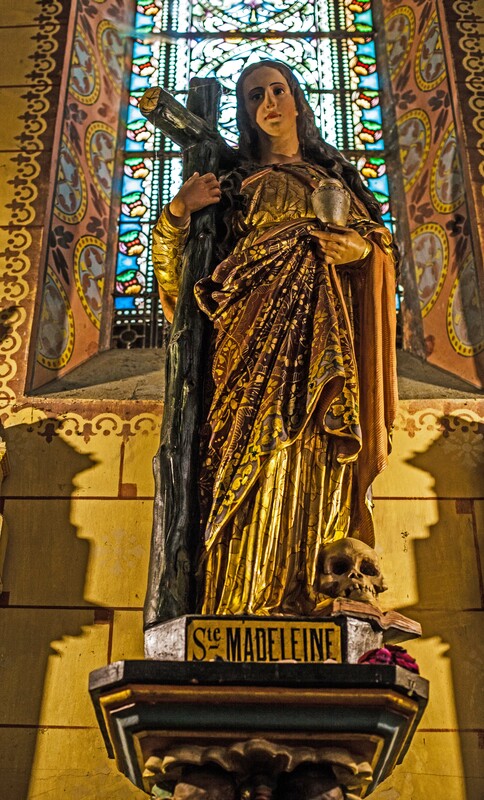 Often the jar in Mary Magdalene’s hand signifies the blood of Jesus. Left is the painting of the Crucifixion from the Basilica Sainte-Marie-Madeleine et le Couvent Royal, in St.Maximin. This is where Mary Magdalene was buried. She is shown at the foot of the cross in a very beautiful almost intimate pose. From this allegations has arisen something of a conspiracy theory: It has it that knowledge of Christ’s alleged relationship with Mary (and perhaps proof thereof) passed from the Cathars to the Knights Templar. It was to remove the threat of this great secret, potentially damaging as it supposedly was to the Church, that the Catholic establishment suppressed the Templars, a century after the Albigensian Crusade. Although the theory probably has a particular appeal to those with a latent penchant for goddess worship in both cases, eliminating of the Cathars and the Templars was pure politics and greed. 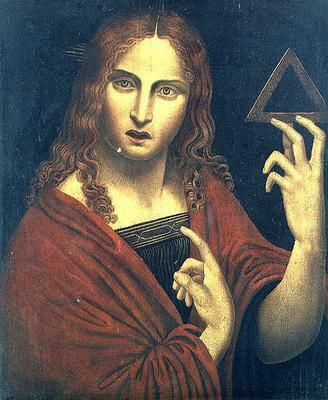 Many esoterics have additionally speculated that Mary Magdalene was herself of royal blood, or a priestess of some Isis/Ishtar cult, and that the Cathars and Templars regarded her almost as the embodiment of the feminine aspect of the divine and the personification of holy wisdom (Sophia to the Gnostics). 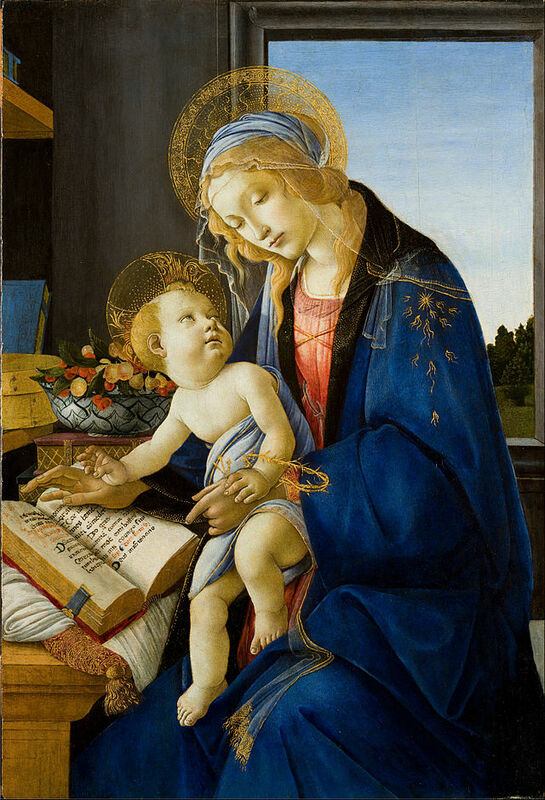 Another theory has Mary and Jesus founding a dynasty, which fused with the Merovingian line. 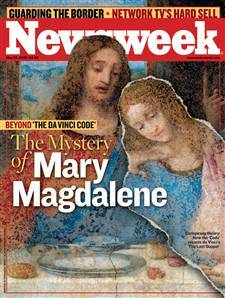 I saw Mary Magdalene statues or paintings in almost ever church. extensively in Rennes-le-Chateau. It must be remembered that she was a legitimate Catholic Saint. Her supposed relics had been claimed by the Benedictine Monks of Vezelay in Burgundy, Central France. The cult was in evidence there from the mid eleventh century. The abbey claimed that the relics had been brought there centuries before by a monk who had retrieved them from their original shrine near Aix in Provence, where Mary had supposedly been lain to rest after spending 30 years living as a hermit in a remote cave called la Sainte Baume .Mary Magdalene is usually thought of as the second-most important woman in the New Testament after Mary. Mary Magdalene traveled with Jesus as one of his followers. She was present at Jesus’ two most important moments: the crucifixion and the resurrection. Within the four Gospels, the oldest historical record mentioning her name, she is named at least 12 times more than most of the apostles. In the New Testament, Jesus cleansed her of “seven demons”,[Lk. 8:2] [Mk. 16:9]. 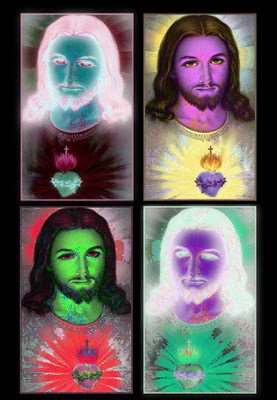 The images of Jesus throughout history are as varied as the people who have embraced him, the Son of God, the Divine Word by whom the world was created, the Passover sacrifice on behalf of the people, the Suffering Servant who takes on the sins of the world, the lesser Prophet, or more recently, Jesus the liberator of the oppressed, the New Age Sun God of the heretic Pharaoh Akhenaten, or a simple tabloid Jesus in love with a woman. The careful reader reader might have noticed, not only in this essay, that I am even fond of the myth around Mary Magdalene. However, each Zeitgeist and generation sees in Jesus a reflection of itself, but the Jesus archetype as cultural pattern C.G. Jung likened to the Self has been alive for 2000 years and is here to stay. That is the essence of C.G. Jung’s archetype, to be in the collective memory, constantly be reborn as symbol. And that is the power Christianity utilized to win and still has. I touched on the lecture about the Roman Mithras cult recently; interestingly almost the complete audience were rather, rather mature women and men. They listened approvingly like they would have done hundred years ago to a sermon, nodding happily on every suggestion that Christianity might have borrowed from Mithras Cult, like this would somewhat invalidate Christianity. However, archetypes are not owned by any religion, every religion uses archetypes in its narrative. They quote each other like another cultural achievement – great art. An exception of the rule is the archetype of Jesus – a god became human, died and became alive again and went to heaven. This archetype is destined to stay, even if after Christianity eases in the mental fog and violent turmoil of radical globalization and neo-feudalism. 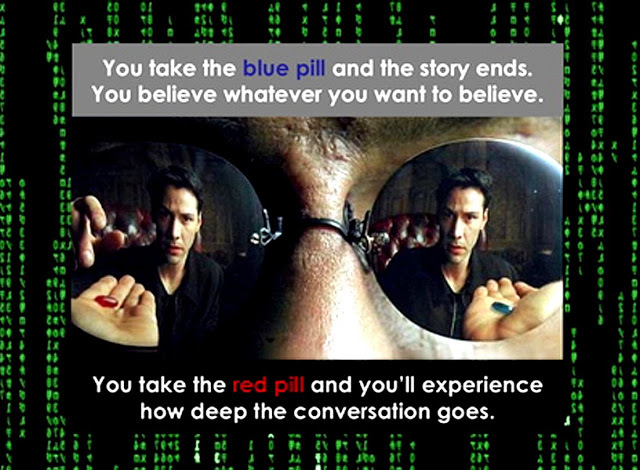 Religions get created, prosper and die, archetypes transcend history and reality but are stunningly real. The Cathar religion represents a major medieval resurgence of Gnosticism, and we offer an important collection of Cathar Texts, including the complete manuscript of the Lyon Ritual, Interrogatio Iohannis, and The Book of the Two Principles. While the Nag Hammadi Library represents the richest source of classical Gnostic texts, many other primary Gnostic documents were discovered in the century prior to the Nag Hammadi find. These are cataloged in the Classical Gnostic Scriptures and Fragments section. Of associated interest is the Christian Apocrypha and Early Christian Literature, a section containing other important Christian texts surviving outside canonical tradition, some of which manifest Gnostic influence. The G.R.S Mead Collection contains over a dozen volumes written by G. R. S. Mead (1863-1933), one the greatest early scholars of Gnosticism. These works provide an invaluable evaluation of texts relating to Gnostic tradition available before discovery of the Nag Hammadi collection. Opinion about the tradition was primarily based on Works Against the Gnostics by the Church Fathers. I included is a full text site search function. A large sample of these is presented in the Manichaean Writings collection, along with an introductory lecture. Also included in the library is a section devoted to Mandaean Texts and this still living Gnostic tradition. The Seven Sermons to the Dead (by Carl Gustav Jung). Excerpt from Elaine Pagels’ excellent popular introduction to the Nag Hammadi texts. The Nag Hammadi Library, a collection of thirteen ancient codices containing over fifty texts, was discovered in upper Egypt in 1945. This immensely important discovery includes a large number of primary Gnostic scriptures — texts once thought to have been entirely destroyed during the early Christian struggle to define “orthodoxy” — scriptures such as the Gospel of Thomas, the Gospel of Philip, and the Gospel of Truth. The discovery and translation of the Nag Hammadi library has provided impetus to a major re-evaluation of early Christian history and the nature of Gnosticism. We have add extensive resources on two centrally important texts from Nag Hammadi: The Gospel of Thomas and The Secret Book of John. Multiple authoritative translations of several Nag Hammadi scriptures are included in the collection. Valentinus and Valentinian Gnosis. Valentinus was one of the most influential Gnostic Christian teachers of the second century A.D., and was the only Gnostic considered for election as Bishop of Rome (Pope). He founded a movement which spread throughout Europe, the Middle East and North Africa. Despite persecution by developing orthodoxies, the Valentinian school endured for over 600 years. A large number of texts in the Nag Hammadi collection are influence by Valentinian tradition. Due to its importance, we have a large section of the library dedicated specifically to Valentinus and the Valentinian Tradition. The Dead Sea Scrolls Collection in the Gnostic Society Library is one of the largest and most referenced Dead Sea Scroll resources on the internet. During the middle years of the twentieth century two important but very different collections of ancient religious texts were unearthed in Palestine and Egypt: the Dead Sea Scrolls and the Nag Hammadi Library. Tags: Archetypes, Art, Black Madonna, C.G.Jung, Christianity, Dualism, female archetypes of love, Isis Osiris Horus, Jesus – seen archetypal, Jesus – seen as cultural construct, Jesus – seen biographical, Jesus – seen from Buddhism, Jesus – seen from feminism, Jesus – seen from Hinduism, Jesus – seen from Islam, Jesus – seen from masculinism, Jesus – seen from the Egyptian god Aton, Jesus – seen from the Roman Isis Cult, Jesus – seen from the Roman Mithras Cult, Jesus – seen from world religions, Jesus – seen sexual, jungian psychology, Languedoc-Roussillon, Mary Magdalen, Mystic, Religion. Bookmark the permalink.